Block at first sight is a feature of next gen protection that provides a way to detect and block new malware within seconds. It is enabled by default when certain pre-requisite settings are also enabled. In most cases, these pre-requisite settings are also enabled by default, so the feature is running without any intervention. You can use group policy settings to confirm the feature is enabled. You can specify how long the file should be prevented from running while the cloud-based protection service analyzes the file. You can also customize the message displayed on users' desktops when a file is blocked. You can change the company name, contact information, and message URL. There is no specific individual setting in System Center Configuration Manager to enable or disable block at first sight. It is enabled by default when the pre-requisite settings are configured correctly. You must use Group Policy settings to enable or disable the feature. You can also visit the Windows Defender ATP demo website at demo.wd.microsoft.com to confirm the features are working and see how they work. When Windows Defender Antivirus encounters a suspicious but undetected file, it queries our cloud protection backend. The cloud backend applies heuristics, machine learning, and automated analysis of the file to determine whether the files are malicious or clean. In Windows 10, version 1803, block at first sight can now block non-portable executable files (such as JS, VBS, or macros) as well as executable files. Block at first sight only uses the cloud protection backend for executable files and non-portable executable files that are downloaded from the Internet, or that originate from the Internet zone. A hash value of the .exe file is checked via the cloud backend to determine if this is a previously undetected file. If the cloud backend is unable to make a determination, Windows Defender Antivirus locks the file and uploads a copy to the cloud. The cloud performs additional analysis to reach a determination before it either allows the file to run or blocks it in all future encounters, depending on whether it determines the file to be malicious or safe. In many cases, this process can reduce the response time for new malware from hours to seconds. Block at first sight requires a number of Group Policy settings to be configured correctly or it will not work. These settings are enabled by default in most enterprise Windows Defender Antivirus deployments. In Intune, navigate to Device configuration - Profiles > Profile name > Device restrictions > Windows Defender Antivirus. The profile you select must be a Device Restriction profile type, not an Endpoint Protection profile type. For more information about configuring Windows Defender Antivirus device restrictions in Intune, see Configure device restriction settings in Microsoft Intune. 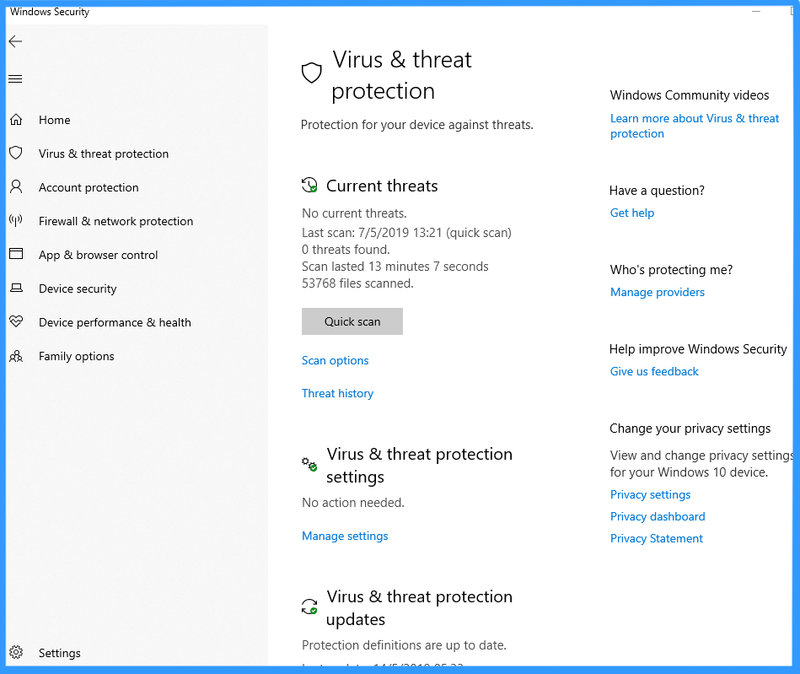 For a list of Windows Defender Antivirus device restrictions in Intune, see Device restriction for Windows 10 (and newer) settings in Intune. Double-click Join Microsoft MAPS and ensure the option is set to Enabled. Click OK. Setting to 0 (Always Prompt) will lower the protection state of the device. Setting to 2 (Never send) means block at first sight will not function. Double-click Scan all downloaded files and attachments and ensure the option is set to Enabled. Click OK.
Double-click Turn off real-time protection and ensure the option is set to Disabled. Click OK. If you had to change any of the settings, you should re-deploy the Group Policy Object across your network to ensure all endpoints are covered. You can confirm that block at first sight is enabled in Windows Settings. Open the Windows Security app by clicking the shield icon in the task bar. Confirm that Cloud-based Protection and Automatic sample submission are switched to On. If the pre-requisite settings are configured and deployed using Group Policy, the settings described in this section will be greyed-out and unavailable for use on individual endpoints. Changes made through a Group Policy Object must first be deployed to individual endpoints before the setting will be updated in Windows Settings. You can validate that the feature is working by following the steps outlined in Validate connections between your network and the cloud. Disabling block at first sight will lower the protection state of the endpoint and your network. You may choose to disable block at first sight if you want to retain the pre-requisite settings without using block at first sight protection. You might wish to do this if you are experiencing latency issues or you want to test the feature's impact on your network. Expand the tree through Windows components > Windows Defender Antivirus > MAPS. Double-click Configure the 'Block at First Sight' feature and set the option to Disabled. Disabling block at first sight will not disable or alter the pre-requisite group policies.